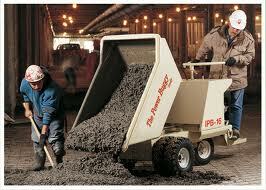 Concrete Buggy - Using A Concrete Power Buggy To Pour A Concrete Floor. A concrete buggy, also known as a power buggy, is great for placing concrete when you can't reach the project you're doing, directly from the concrete truck. 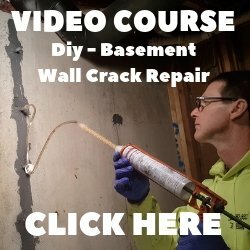 If you're thinking of renting one to use on your next concrete placement fear not, it's really quite simple to operate. Most are hydrostatic drive, go forward and backwards, have a brake to stop and a foot and hand lever to dump the bucket. Steering is just like riding a bike, very simple, as long as your on solid ground and not sand or mud. Using a power buggy to pour a concrete floor is much faster than using a wheelbarrow. As far as weight comparison, typically a wheelbarrow can hold up to 500 lbs of concrete and a power buggy can hold up to 3200 lbs of concrete. 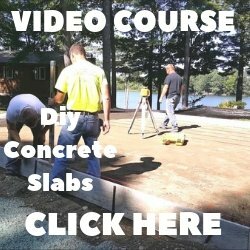 Reduces Labor: If you've ever tried to push a full wheelbarrow of concrete over uneven and unstable ground you know what I mean. A concrete buggy lets you do the same amount of work on a larger scale with only having to push and pull a lever. Less Chance For Injury: A power buggy requires much less effort and physical ability than pushing a full wheelbarrow does, lowering the chance of muscle pulls or lower back strains. Saves Time: One power buggy can hold up to 8 full wheelbarrow loads of concrete getting the pour done much faster with less men. 1. Walk Behind Buggy - This type of power buggy is good for smaller jobs and shorter distances. 2. Ride On Buggy - This type of power buggy is has a platform you stand on. Great for bigger jobs and longer distances. 3. Sit On Buggy - This type of power buggy has a seat and steering wheel. Also great for larger jobs and long distances. 4. Robotic Buggy - This type of power buggy is remote controlled. Yes, that's right, remote controlled. How much weight can a concrete power buggy carry? The capacity of a power buggy varies depending on the bucket size, which is measured in cubic feet. Bucket sizes range from 10 to 16 to 21 cubic feet with the most popular being 16 cubic feet. 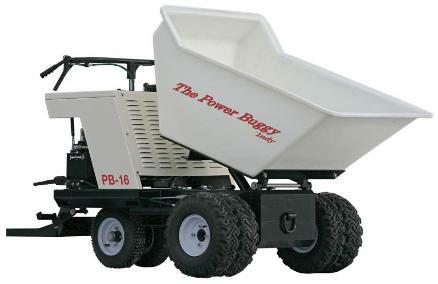 A 16 cubic foot power buggy can carry 2500 pounds of concrete. How fast is a concrete power buggy? The newer model power buggies have a variable hydrostatic drive system which allows you to ease up or down from 0 - 7 miles per hr. These are easy to control and drive through a job-site without damaging anything. The drive lever is controlled with the right hand and the brake with the left hand. The bucket dump lever is usually on the right handle bar and/or can be controlled by a foot lever. The dump lever is hydraulic which gives you the ability to dump the load very slow or fast. Which is better a power buggy with wheels or tracks? Most of the time concrete buggies with wheels will do the job. 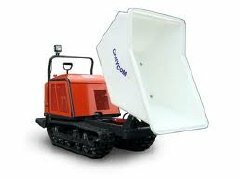 However, If you have to transport any concrete over sand, mud, or soft sub-grade material, then a power buggy with tracks works best. The width of a concrete buggy varies, but will usually fit through standard door openings in most buildings. The outside wheel on some models of duel wheeled buggies can be taken off for extra clearance in tight spots. Concrete power buggies can also be used to move stone, dirt, and construction debris. Most rental stores have a power buggy. The average cost for a days rental is about $125.00.